A consequence of history; fragmentation of Earth science information into disciplines of study and separate administrative jurisdictions is incongruent with natural co-evolved processes - phenomena - of ecological and economic importance. Major disturbances, defined as anomalies, are unanticipated because our collective understanding is scattered among a multitude of custodians; effectively lost. Climate, oceanographic, atmospheric, landscape ecological and economic systems all have one thing in common: Anomalies and system changes can be tracked by observing impacted plants and animals in-turn representing biological proxies for types of disturbance. Assimilation of proxy data to form time series of anomaly observations helps us create the baselines required for subsequent monitoring.(below). The more we reassemble observational fragments, the more accustomed to disturbance we become, and as such, we are less likely to consider phenomenon anomalous. Civilization can either resist or adapt to disturbance. Adaptation requires the recovery of past anomaly observations and better anticipation of changes by reconstructing place specific disturbance regimes. Characterization of regimes is quick and comparatively less expensive than initiating unprioritized catch-all anomaly monitoring programs. Data reconstruction helps managers better evaluate ecological and economic impacts and is of immediate benefit to epidemiologists under pressure to anticipate future occurrences. -> Mining of the thousands of scholarly publications and government documents relevant to disturbance information for data discovery. -> Use of canonical semantic keyword associations and neural networks to assist in data recovery. -> Facilitate training workshops designed to build research consensus and inter-institutional coordination. -> Develop virtual scientific networks to consolidate observational data and maintain an expert review systems to reconcile disturbance, scale, and quality issues. -> Consider the use of mass media reports and observational contributions from voluntary observers and the general public to fill gaps in custodial records. An information system and interface capable of consolidating event reports from a diversity of sources, available here for demonstration purposes only. Training material concentrating on the standardization and organization of historic data combined with assessment of data integrity and coverage. Proposals for future standardization of observation and assimilation systems. A database archive of co-occurring morbidity, mortality, disease and invasive species events. 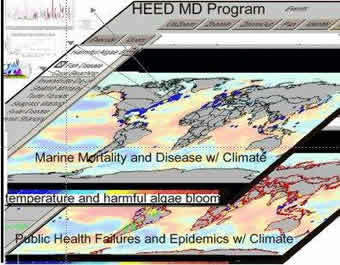 An ecoindicator framework designed to facilitate an integrated assessment of ecosystem health. From the perspective of a researcher studying a particular patch of land or seascape, collecting prior research products representing location, time and tracking down other's methods, remains the greatest obstacle in environmental characterization. --- Prior observations form the context for ALL contemporary observation. Recovery of place specific disturbance regimes from the re-assembled information by-products of past studies is possible. One strategy is to focus on meta-data (data about data) and to extract this information from bibliographic archives using keyword searches. This can then direct efforts toward appropriate acquisition of the primary data itself. The literature/metadata mining strategy is expedited through an interdisciplinary process outlined here. The process is designed to be expedient, cost effective, useful to resource managers, and ultimately advances science by helping researchers generate hypotheses. 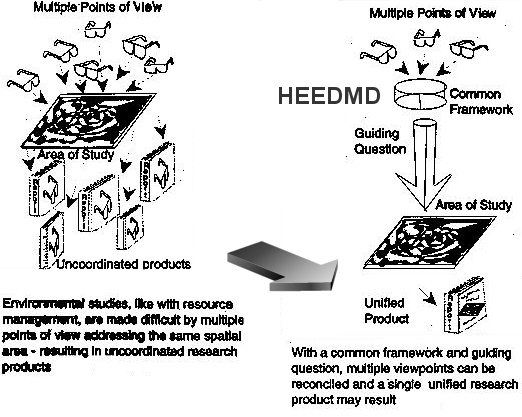 HEED MD is a membership organization. All data and information contained within this site are protected by Copyright (© 1995-2009) mediated by a specific data-sharing cooperative agreement.